"The gasoline station at 40 Water Street was owned by Arthur H. Saunders from the late 1920's until 1938 when an 'out-of-town' man bought the station, and owned it for one year. During Saunders' ownership, John L. Neiss managed the station, and, in 1939, he became its owner. The station was called the Center Service Station for its proximity to the Center (railroad) Station. The Center Service Station sold a complete line of Gulf products and specialized in 'scientifically-designed Gulflex lubrication.' By 1939, a 'heated lubritorium' was added which enabled attendants to give quicker and better service. In addition to the service station, John Neiss also conducted a range oil business, utilizing two oil trucks. Fuel oil remained a part of the business until World War II. 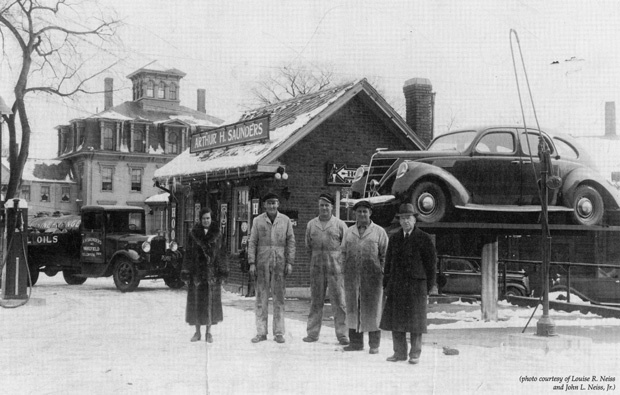 Mr. Neiss owned the station until 1955 when it was sold to the Hubbard family. Gulf Oil leased land from the Boston & Maine Railroad and eventually a new Gulf station was built where the Center House in the background, once used a a hotel for guests and associates of Cyrus Wakefield, once stood." -- Text from calendar by Jayne M. D'Onofrio. Photo courtesy of Louise R. Neiss and John Neiss, Jr.
“Arthur H. Saunders Gasoline Station, 40 Water Street, circa 1930s,” NOBLE Digital Heritage, accessed April 22, 2019, https://digitalheritage.noblenet.org/noble/items/show/6867.